Jotun's Bane Kindred is located in the Kansas City Area, in the middle of the United States of America. Kansas City stradles the border between Kansas and Missouri, and is located where the Missouri River and the Kansas River meet. Kansas City is the largest city in the state of Missouri. It encompasses 318 square miles in parts of Jackson, Clay, Cass, and Platte counties. The city also serves as the anchor city of the Kansas City Metropolitan Area, the second largest in Missouri, which includes counties in both Missouri and Kansas. As of 2006, the city had an estimated population of 447,306, with a metro area of nearly two million. 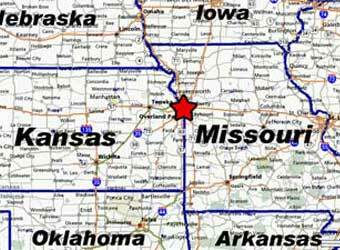 Kansas City, Missouri was founded in 1838 as the "Town of Kansas," and was incorporated in its present form in 1850. Situated opposite Kansas City, Kansas, the city was the location of several battles during the Civil War, including the Battle of Westport. The city is well known for its contributions to the musical styles of jazz and blues as well as for Kansas City-style barbecue. It is officially nicknamed the City of Fountains, with over 200 examples, the city claims to have second most in the world, just behind Rome. The city also has more boulevards than any city except Paris and has often been called "Paris on the Plains." Informal nicknames include BBQ Capital of the World, and residents are known as Kansas Citians. It is sometimes referred to colloquially as the Heart of America as it is near both the geographic and population centers of the United States. Jotun's Bane Kindred calls the Kansas City Area its home...and we're proud of where we live. If you live or are visiting in our area, please come to one of our Open Pubmoots...or contact us by e-mail at mark@heathengods.com or on our message board. We'd like to meet you!